After a long Thanksgiving weekend spent with family, the idea of booking a hotel for a Christmas and/or a New Year’s Eve getaway may sound better than ever. For the past few weeks, I’ve been testing two digital tools that use distinct criteria for booking hotel rooms: HotelTonight and Room 77. HotelTonight aims to get people into rooms no matter how late they book, and Room 77 wants to get people into the specific room they want. HotelTonight is a free app that works strictly for same-day hotel bookings. Once installed on an iPhone or Android smartphone, it will display about three steeply discounted hotel rooms per city after noon local time each day, when hotel representatives know what will be available that night. Right now, the app can find hotels in some 28 cities, as well as several nearby getaway destinations (like Cape Cod for Boston). HotelTonight plans to add more cities like Tampa, Fla., and Palm Springs, Calif., and will expand in existing cities. An iPad app is planned for early next year. 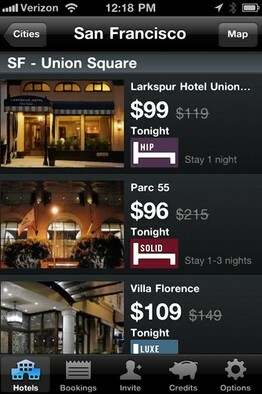 HotelTonight’s deals for San Francisco hotels. HotelTonight seems more serious about getting guests in beds than big-name rival sites. Many competitors, including Travelocity and Hotwire, offer same-day hotel bookings, but they don’t reveal the name of the hotel or its location until you book it. HotelTonight shows all information about a hotel. Another difference is HotelTonight lets people snag rooms until 2 a.m., instead of the usual cutoff time of 11 p.m. But HotelTonight users can’t specify the type of room or bed they want. All rooms are just guaranteed to sleep two adults. Using the HotelTonight app on an Android device and an iPhone, I found good hotel deals in my home city of Washington, D.C., as well as other cities like Boston. A categorization system labels each hotel as basic, hip, classic, boutique, elegant, luxe or solid. Among the deals were the Washington Court (classic), very close to D.C.’s Union Station for $99 instead of $147; Chicago’s Wyndham Blake Hotel (solid) for $379 rather than $455; and the Langham (luxe) in Boston’s financial district for $199 rather than $275. One getaway near Washington, D.C., was the famed Inn at Perry Cabin in St. Michaels, Md. The deal offered rooms for $195 a night rather than $215, and guests could stay up to five nights starting on a Monday. Room 77 is a free website and an app for iPhone and Android that gives guests the inside scoop on hotels and rooms before they book. It looks at some 750,000 rooms and offers details like size, views and which floors are the quietest. 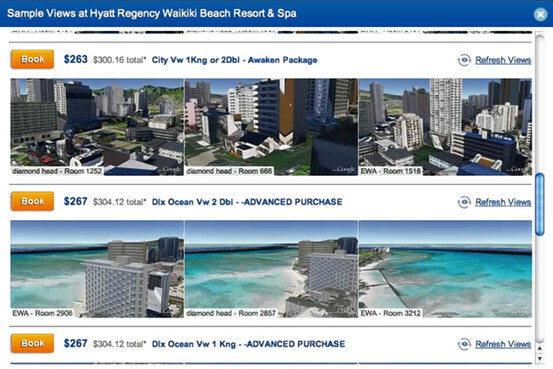 Room 77 shows detailed information on hotels, including sample views, such as those from rooms in a hotel in Hawaii. What I found most useful on Room 77 was that some hotels include floor maps that let you see more clearly how the hotel is laid out. By selecting a room on the floor map, you can see Google Earth images of the views from that room. You can narrow room choices to floor (high or low), view (important or not important), elevator (near or far) and connecting room (yes or don’t care). A data sorter on the left of the screen lets you narrow hotels to those with free Wi-Fi, free parking (a big plus in cities), free breakfast or free hotel shuttles. I used Room 77 to investigate the Hilton Riverside in New Orleans, where I’ll be staying for a wedding in March. I narrowed my search to rooms on high floors that had views of the Mississippi River and were far from the elevator. Unfortunately, the wedding-party discount couldn’t apply on Room 77, so I couldn’t actually book through the site. If you do use Room 77 to book, a feature called Room Concierge asks you to fill in your room preferences, including specific room numbers (if applicable). The largely automated service informs hotels of your request and follows up until a room that best matches your preferences is found, all the while sending you updates on the status of your request. 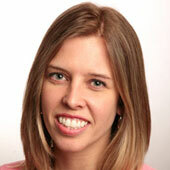 Room 77 is exploring ways people who book hotels elsewhere can use its room-finding service.